I haven’t read these essays but I can’t help feeling this was a terrible idea for a book. Or an essay. I don’t ask my childless friends why they don’t have children. I don’t want to be asked why I have them. No matter what the question is, the answer is: mind your own business, and thanks for never bringing it up again. I don’t need a history lesson and I don’t need to hear from someone without children that I’m doing it wrong. I would mortified to hear someone tell them that they are doing it wrong. No one should be asked to justify the decision and for darn sure no one should be put in a position of justifying it, when justifying it means being critical or dismissive of others who made a different choice. And how well I know that it is rarely a yes/no situation. The “decision” to have/not have children was almost made for me, by circumstances, not one of which I wish to share with my friends, let alone the world. My sister has no children. She decided she did not want to. End of story. I don’t and I never would bug her about it, even if I wouldn’t make the same choice. That’s how the dialogue needs to go – no dialogue. The thing about NOT having kids is that it can be very lonely. At a certain age, most of your friends disappear into parenthood. They hang out with other parents, at children’s birthday parties, etc. And if you don’t have kids, you start to feel isolated. So I’m grateful for this book because it offers companionship to childless adults and because it reminds people that there are many models of adulthood. @jacques fleener — Yes, I don’t generally ask friends and strangers why they did or didn’t have children –That would be rude and intrusive. You’re also right that you don’t need to hear from everyone regarding your childrearing practices — and what IS it about holding a baby that makes everyone want to jump in with advice and dire prognostications? These essays, however, ask artists ( and many female ones, it seems) to speak to their decisions in terms of their creative lives. The big questions — can the care taking artist/parent do both jobs or do they each seem to cancel each other out? do you regret either decision? Do you wish you had/hadn’t conceived? Is it possible to be a caretaker and do any other job as well as you should? — these are serious concerns for many of us, especially women, to whom the lion’s share of care taking still falls. I don’t think it’s intrusive to ask for an essay about compelling subjects –the writer could refuse if s/he is uncomfortable. And the many sidebars Ms. Lepucki quoted are so spot on — the tyranny of “instant adoration” of the infant! Everyone cooing and assuring you that this is the best thing you ever could or will ever do! Yes, I do think my girl is the best thing I ever did but it took me a heap of messy living and everyday wonder and spit up to see that. Societal expectations of mothers vs. the needs of mothers/parents themselves — that’s potent stuff and i am interested to hear from writers on this. So, thank you for this, and especially your final 2 paragraphs. Lovely! I have kids now, but those difficult times are powerful memories. But you’re right, if some people find solace or wisdom in the book, then it has value. Hopefully it will end up elevating the dialogue and increasing empathy and compassion, and not as I fear merely further polarizing the issue. Jaques, your response seems overly defensive. People write and read books because they value dialogue, even about personal issues. So I’m not sure why the topic of parenthood should be off limits. If you don’t want any dialogue, no one is forcing you to read this book (which you clearly won’t) or this post. Maybe the rest of us find some value in dialogue. And I apologize for the multiple posting, but I do recognize that the issue can be considerably more difficult for women in our society than for men. I’d hate to seem like I didn’t realize that. Anyway this has all given me a lot to think about this morning. @Jacques Fleener — I’m glad you posted. I was coming back in to say I get how intrusive busybodies can be when you have or don’t have children — infuriating! And did not mean to imply that only Mom’s face these issues, of course, dads do, too. “And where are your kids?” – Aaargh! You are right that these are personal decisions — it’s really only in a public venue that we can discuss them fully. I appreciate your points and will also think. Thank you for expanding the discussion. That’s meaner than it sounds – I like Edan’s writing in general quite a bit. I just wonder where upper-class well-educated people get these opinions? Did no one take a biology course? I think probably it has something to do with specialization: most writers major in creative writing in undergrad… Wish there were more writers with like, chemistry majors, or something, to get beyond this intellectual monoculture. 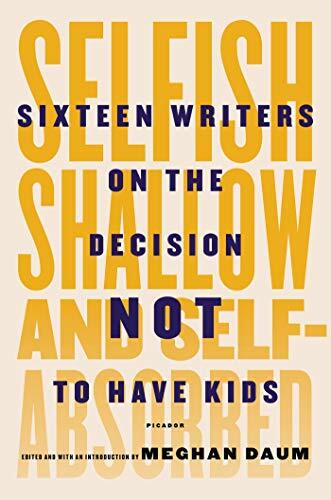 As someone who writes and who planned never to have a kid but then got pregnant and decided to go through with it, I often feel that split between my current self and my imagined childless self (which existed until I was 36) that Edan Lepucki describes here. I look forward to reading this collection. I enjoyed this review tremendously and have already purchased the book. There weren’t any stories like mine — I was definitely not going to have children, until my sister had a son, who I adored, and then a daughter, who I adored, and after that the path was crooked, but I eventually had a fantastic son who changed my life. But I consider myself as someone who both did and didn’t choose parenting. I don’t recall ever having had a forum to really talk about that, and now, this book gives me all kinds of ways to think about it. @priskill and Isaac James Baker, agreed. Re other comments, I am always fascinated when someone who doesn’t understand the quoted material and hasn’t read the quoted author has such harsh opinions. Kipnis, and Edan Lepucki quoting Kipnis, is NOT making a point about biology. It is a quote about something very specific, a social and cultural construct called the “maternal bond.” This is akin to saying, for example, that hyperactivity is a modern social construction. There was no such diagnosis until recent years; it is, no doubt a real condition in some people, one that has served the pharmaceutical industry very well, but it is an unquestionable outgrowth of the conditions of late twentieth century advanced societies (you don’t find hyperactivity in say, nomadic tribes that are constantly engaged in physical activity or highly impoverished ghettos where children don’t have enough food to lift a finger). On the maternal bond in particular, there are piles of studies confirming that maternal bonding, however real it may feel for some people, is still a modern social construction. Much of this research is an outgrowth of concerns about parenting and post-partum depression, etc., pointing to the fact that not every mother feels a natural maternal bond. The anthropologist Nancy Schepper Hughes did one of the best studies of maternal bonding (or lack thereof) in her book called “Death without Weeping” (1993). In a nutshell, the finding was that in conditions of HIGH infant mortality, mothers appear not to bond with their infants because there is such a high likelihood of them dying. They are, in fact, ostracized for bonding too closely with their infants because the lives of older children are also at risk in such harsh conditions and too much attention to babies puts the older (more likely to survive) children at risk. I loved this essay and really appreciate Edan’s frankness with her own parenting, too. Thank you so much, Edan Lepucki, for a wise and thoughtful reflection on your own choice of parenthood. I will hang onto this review and re-read it many times, I am sure. I thank you in particular for saying that it would have been okay had you not taken the parenthood path – a simple sentiment with so much power. We really will all be less isolated when parents and non-parents stop judging one another for decisions that are so extremely personal and nuanced. Taking the extra step of trying to understand one another would be truly awesome. As your friend so astutely pointed out, “Isn’t everyone doing their best? Isn’t everyone scared?” Yes and yes. Just got my book in the mail today and I am going to start reading it now! Thank you again to The Millions and to Edan for this refreshing review and especially to Meghan Daum, Elliott Holt and all the other wonderful writers who came together for this important project. So grateful to you all – you really are making a difference. Edan, I don’t how you managed to sound so supportive yet so condescending towards the decision to remain child-free. Umm, thanks?? I get this attitude a lot from parents who want to be seen as liberal-minded while still wanting you to know they think you’ve made the wrong choice. I would’ve preferred to read a review from someone who chose not to have children. Regarding loneliness, we are all lonely. My friends with children freely admit that most of the friendships they’ve cultivated since having children revolve around their childrens’ friendships not the fact that the parents actually have anything in common. Lovely review! Thank you, Edan. Really? Who told her that? From the Bible onward there are myriad powerful examples in art and literature that people certainly did talk about that bond. The particular bond between a child and a parent is something that doesn’t change under the weight of cultural trends. Regardless of the millenium, era, or generation we find ourselves in, the innate soul and emotional substance of the human being–particularly where blood relationship is concerned–comprise some perpetual constants. Familial affection and altruism are, at their core, a matter of evolutionary necessity. And a matter of fact. Equally naive is Lepucki’s dismissal of the parenting stance that Hawthorne’s wife apparently espoused. To say “Do we need to be taking such ye olden parenting advice?” is like saying, “Do we really need to be taking ye olden advice of Socrates or Confucius, Descartes or Locke in the modern age?” It’s silly. Deep thought, wise counsel, and good advice are never outmoded. If Hawthorne’s wife said we need infinite patience, tenderness, and magnanimity to raise a child, she was absolutely right. But she also seems to have understood, as we all do, that our powers are “finite” and that (in answer to Lepucki’s question), no, or course nobody is capable of fitting that bill. She was describing a standard and a mood that proves a pretty good guide for parents. It will continue to be a good guide hundreds of years from now, regardless of how fast we’re living or what modern culture is offering us. (I am a working mother, by the way.) I tend agree with writer Rosemary Mahoney’s assertion that if you bring a child into the world, it’s your responsibility to put the child first, at least for the first ten years or so, when the child is so vulnerable and uninformed and so often confused and afraid. That’s not a childish viewpoint at all. Quite the opposite. I can’t wait to read this book, and I thank Edan Lepucki for bringing it to our attention. She decided she did not want to. End of story. I don’t and I never would bug her about it, even if I wouldn’t make the same choice.